The Vatac Segmented Ball Valves are quarter-turn control ball valves for accurate throttling control of fibrous suspension applications plus clean, dirty viscous, and corrosives liquids and gases. They are designed to meet the highest industry standards for dynamic performance. Flanged or flangeless designs meet ANSI or ISA face-to-face dimensions. 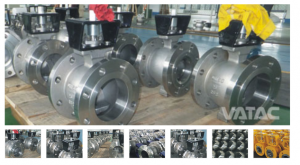 Vatac Segmented Ball Valve design features include blow-out proof shaft protection, high flow capacity, splined ball-to-shaft connection for ease of maintenance and zero backlash. Seat options include flexible metal, rigid metal and PTFE seats. Segmented ball valve has either a ‘v’ shaped Segmented ball or a Segmented seat. This allows the orifice to be opened and closed in a more controlled manner with a closer to linear flow characteristic. When the valve is in the closed position and opening is commenced the small end of the segment is opened first allowing stable flow control during this stage. This type of design requires a generally more robust construction due to higher velocities of the fluids, which might damage a standard valve.